"So what is Thanksgiving?" I asked myself. We don't have that back home. I am from Germany, so I was both excited and clueless about the Thanksgiving holiday. I wondered why people go home on that special day, travel miles and miles to see relatives and parents. 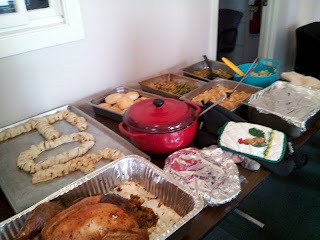 My image of Thanksgiving was of turkey, wool sweaters, pumpkins and lots of food. So I set out to figure out what this holiday was all about. I have loved my work at our soup kitchen so far this year. We are open every day of the year, including Thanksgiving, so I was able to get a unique perspective on the holiday by spending it with our guests. One of our guests, Hector, helped me to understand Thanksgiving by sharing wild stories about the pilgrims. The dining room was decorated; stacked pumpkins and greens helped make the room look nice and festive. School children donated artwork wishing our guests a Happy Thanksgiving and detailing things they were thankful for this Thanksgiving. I noticed that the people around me were in the best mood, not that they aren't all of the time, but especially during the holiday. Then there was the food. TURKEY...tons of turkey! We spent about 3 days preparing turkeys for Thanksgiving. I got to learn what the Thanksgiving menu is all about. Turkey (of course), mashed potatoes, cranberry sauce, stuffing and casseroles. Delicious! Despite being open on Thanksgiving there was no rush or hectic feeling to the day which I really enjoyed. Being together with the guests, without rushing, enabled me to enjoy great conversations that made me truly thankful. I have a sense of security and welcome here with the guests and especially on Thanksgiving. 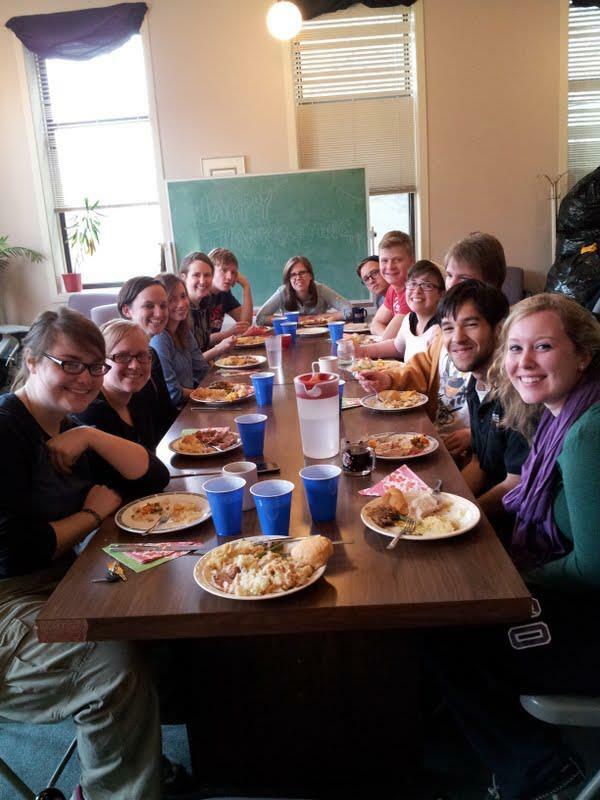 Thanksgiving also showed me that all of our guests are deeply grateful for Franciscan Outreach and what we are doing. For about two weeks before Thanksgiving our community began planning our own community-Thanksgiving which was on the following Sunday. 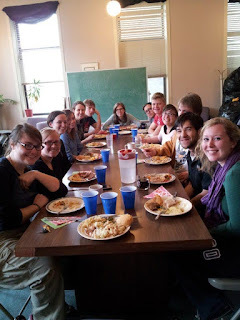 I loved being together with everybody for a "lunch-dinner-meal" at 3pm in the conference room of our home. We each took a moment to share what we were thankful for, many sharing their gratitude for being in community with one another this year. There, I think I really felt what Thanksgiving was all about, sitting together with people you love and just enjoying good food and conversation. Delightful! All-in-all, I can say that Thursday-Sunday taught me a lot about Thanksgiving, being in community and especially being thankful for all the small things. On Thanksgiving it is important to just enjoy being with people you love. 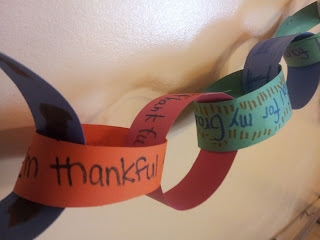 Thanksgiving is a day of relaxation, of love, of joy and of giving thanks.